Isabel Raine thought she had everything–a successful career, a supportive family, and a happy marriage to the man she loved. Then one ordinary morning, her husband, Marcus, picks up his briefcase, kisses her good-bye, and simply vanishes. That day, all her calls to him go straight to voice mail; the messages she leaves at his office go unreturned, too. Panicking after finally receiving a call from his cell phone in which all she can hear is a man’s terrified cry, Isabel calls the police. But they aren’t interested. Men leave, they tell her. They leave all the time. Desperate to find her husband, Isabel races to his office. But instead of finding him, she finds herself in the middle of an FBI raid. Hours later, she awakens in the hospital with a severe concussion and a homicide detective by her bedside waiting to question her about Marcus Raine–the real Marcus Raine. Now the only thing Isabel knows for sure is that her husband of five years is gone. Where is he and who is he are questions no one seems able to answer. But Isabel will not rest until she discovers the truth about the man she loves, even if it means risking everything–including her own life. Bestselling author Lisa Unger takes us on a nightmarish journey from bustling, glamorous New York City to the murky, twisted streets of Prague, seeking the answer to one bone-chilling question: What if the man you love, the one sleeping beside you, is a stranger? "If you haven't yet experienced Lisa Unger, what are you waiting for?" 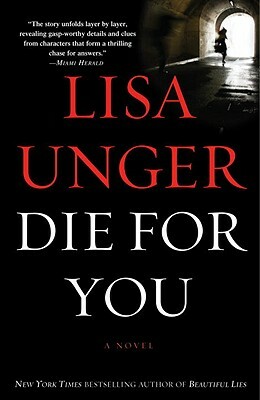 "Unger has proved herself to be a master of pacing and suspense and DIE FOR YOU is no exception; in fact, it is the most nerve-wracking, hand-wringing book I’ve read by her to date. This truly is edge-of your-seat action and my whole body was tense while I read. BUY THIS BOOK!"